One of the most popular designs in Southwest Silver Jewelry is the Buffalo Ring. Anglo men and women have always been drawn to Buffalo since the days of the cowboy and the Native American Indians have been respected the Buffalo as a provider of life. It is only natural that many men and women would love to wear a good looking silver or gold Buffalo Ring. There are many different types of Buffalo Rings, you can find many types of plain silver buffalo rings, and even a Buffalo Ring with Turquoise, Coral, Silver Ore, or Variscite. 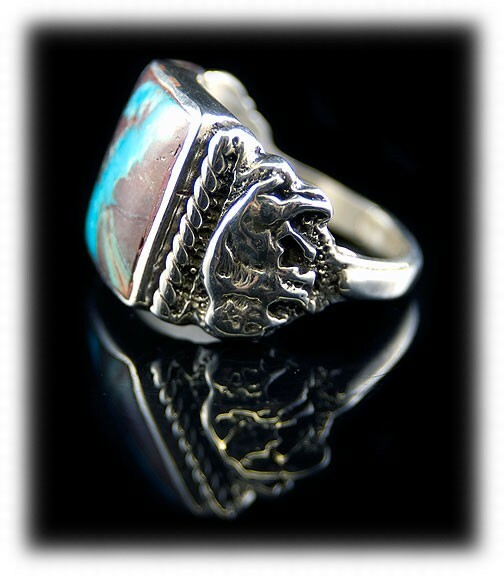 The Durango Silver Company makes a great Buffalo Ring that is shown above. 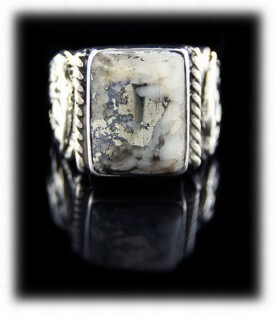 We make this with many different gemstones, it is shown in White Buffalo Turquoise and high grade Silver ore below. This Buffalo Ring was first designed by John Hartman of Durango Silver Company, it has a hand carved Buffalo on each side of the gemstone with a cable design next to the bezel that holds the stone. Our most popular Buffalo Ring has been adapted by Dillon Hartman and he now carries on the tradition of the Buffalo Ring with new, exciting and unique stones each time. To the left is a Buffalo Ring with a high grade Silver Ore gemstone. This Ring has a fairly large stone yet it is very comfortable to wear and men really enjoy this Buffalo Ring. The Silver Ore from Silverton, Colorado USA is a very neat and different stone to have in a one of a kind Buffalo Ring that focuses on a gemstone. To the right is a Buffalo Ring with a White Buffalo Turquoise gemstone. This Ring does not have the carved Buffalo's on the sides, it is another very nice mens ring from our company that is a very popular style. 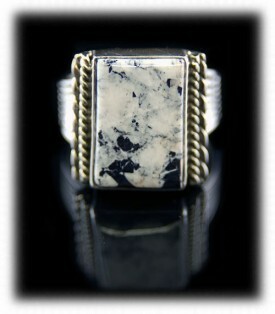 It is really neat to have "White Buffalo" in a buffalo ring as the stone shares the same name. Follow Durango Silver Company to see when we come up with new Buffalo Rings. You can be sure we will have more than one Buffalo Ring in the future. We hope you have enjoyed our presentation on our Buffalo Ring and have gained some useful knowledge from it. We invite you to learn more about our Silver Jewelry by following the links in our Learning Center to other informational pages that we have written on different topics related to Silver Jewelry. In addition, we would like to invite you to join our E-Mail Newsletter - about once every other month we send out a Newsletter to inform our members of what's happening with Durango Silver Company, new products, specials for our members and more. We also have a monthly drawing from our member base to give away free Silver Jewelry from our company. Please take a moment to become one of our friends by signing in below. We hope you will consider Durango Silver Company for your Buffalo Ring.